Acute kidney injury (AKI) can affect up to one in four patients admitted to the intensive care unit (ICU), of which 30–40% are seen in perioperative setting. AKI impacts survival, costs of care, and long-term risk of chronic kidney disease. Our current understanding of perioperative AKI is based on predominant literature from cardiac surgery. Here, we describe recent data on epidemiology, risk factors, and management of AKI in different non-cardiovascular surgical settings. Both the frequency and risk factors of AKI have some commonality across diverse settings; however, each non-cardiac surgical setting poses a unique set of circumstances that affect renal function. 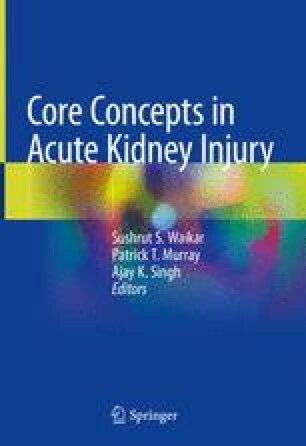 The chapter discusses perioperative settings of abdominal, nonrenal solid organ transplant, kidney cancer, trauma and burns, and orthopedic and gynecological surgery. Two commonly occurring syndromes of abdominal compartment syndrome as well as rhabdomyolysis are discussed in detail. Management of AKI in this setting relies on prevention, early recognition, maintaining renal perfusion, and avoiding nephrotoxins. We also discuss recent data on type of intravenous fluids and risk of AKI, as well as associations between concomitant treatments by renin-angiotensin system blockers, statins, and other possible nephrotoxins in perioperative settings. A brief account of dialysis therapies is also included. 10.27.15. American Society of Anesthesiologists—Surgical patients should stay on cholesterol medications to reduce risk of death, study shows [Internet]. [cited 2015 Nov 29]. http://www.asahq.org/about-asa/newsroom/news-releases/2015/10/surgical-patients-should-stay-on-cholesterol-medications.